You have a lot of options on who to work with on your estate planning. Whether you want to create a Last Will and Testament, something a little more sophisticated like a Revocable Living Trust, or whether you just need a current Financial Power of Attorney or Advance Directive for Health Care, choosing who to work with is one of the most important decisions in that journey. Here are 7 tips when deciding who to work with on your Estate Plan. There are many non-lawyers and non-lawyered companies out there that promote estate planning services. But, these individuals and companies aren’t governed by the strict rules that attorneys are governed by. As an example, I’m aware of at least one company in Colorado that touts the “tremendous sense of confidentiality” a person should have by working with someone from out-of-state. The problem, however, is that this company provides no actual confidentiality to its customers and, in fact, routinely shares the personal information of its customers with other companies and entities. This would not happen if you were working with an attorney. Attorneys are governed by the attorney-client privilege. That means we cannot disclose your personal information without your permission. There is no stricter form of confidentiality than the attorney-client privilege. So, if a company is telling you they offer you confidentiality, get it in writing and have penalties for them if they disclose your information. You’ll see they are less inclined to work with you when you ask that of them. As a general rule, you should work with an attorney in your state. For the most part, attorneys can only practice in the state where they are licensed. So, if you are working with someone from out-of-state, there is a good chance they are not an attorney and you should be aware whatever you tell them runs the risk of being shared with other people, some of whom you know and rely upon. It is not unusual that these non-lawyer companies run afoul of the law and end up costing your children after you’re gone or even you while you are still alive. That’s because only lawyers can give legal advice and explaining the difference between a Will and a Trust and which you should go with is legal advice. In Ohio, one of these companies was sued for the unauthorized practice of law and the Ohio Supreme Court ordered the company to disclose the names of all of their Ohio customers so that the local bar association could contact the customers to advise them of the company’s conduct and suggest to them that they should seek legal advice from an actual attorney. Further, attorneys are not allowed to have conflicts when it comes to representing their clients. In other words, we have to put your interests ahead of our own. If you are working with or planning to work with one of these out-of-state companies, get it in writing from them how they get paid and who is paying for those services. You’ll discover that they are awash with conflicts because, often times, they are being paid by people they want you to name as a beneficiary to your estate. Don’t risk your children’s inheritance by working with one of these out-of-state companies. Work with an Estate Planning Attorney licensed in your state !! You should work with an attorney who practices exclusively in the area of Estate Planning and Estate Settlement. There are many laws, rules, and regulations when it comes to Estate Planning. Some of these laws are found on the federal level, such as the federal estate tax. Others are found on the state level, such as the laws governing which Trusts you can create and use. Additionally, there are rules that often get disseminated through the common law, when courts interpret the laws through court cases to establish a rule for Estate Planning. Then, there are IRS regulations that apply to estates. Someone who doesn’t practice exclusively in the area of Estate Planning could easily miss these changes as they occur. The law changes every year. You and your family need someone who keeps up with these changes for you. Don’t get pushed around by lawyers who are anything less than crystal clear and 100% up-front regarding the fees required for the legal services to be rendered. If you find yourself about to work with an attorney that doesn’t offer a fixed, flat-fee for their estate planning services, it could be a bad sign. For example, perhaps they are unclear about how much work is involved because they are inexperienced in the area of estate planning. Most estate planning attorneys who have been doing this work for a while will have a good, general idea of the work involved in establishing your estate plan because they’ve done something similar before and they spend the time to get to know your needs. If an attorney will only prepare your estate plan by charging by the hour, then you may be surprised when you get the final bill and you shouldn’t be surprised when it comes to fees for estate planning services. Let’s face it – lawyers in general have a well-deserved, awful reputation. You should work with a firm that guarantees that if you don’t get the service you expect, you get your money back. One of the things that I pride myself on is our firm’s reputation. As I tell the many clients and prospective clients I meet with, I work for referrals. In some instances, I can track a client to another client at six degrees. In other words, one of my clients referred another client to me and so on and so on until the sixth client signed on board. To me, that’s a sign I’m doing things right. You should work with an attorney that you have no trouble speaking with and that you can get on the phone. One of the number one complaints I hear from people I meet on the street is that they can never get their attorney to call them back. We have a policy at our office that we strive to return all phone calls within one business day. You should work with an attorney who explains things in an easy-to-understand format. This will give you peace of mind that your greatest family concerns are addressed properly. Although there is a need in many places in your estate plan to use formal legal language, your attorney should be able to explain these things to you in easy terms. My experience has been that you should be as able to talk to your attorney as you would if you were sitting at the dinner table. See what others have to say about the law firm. You should use one that is referred by, at least, hundreds of others. Go to their website and see if hundreds or thousands of others have had great things to say about the law firm you select. There is no greater way to evaluate a law firm than by seeing what others say about their services. By working with an attorney who regularly speaks and writes about important estate planning topics, you’ll see that the attorney is on top of, and well-versed, in addressing the estate planning needs of families like yours. 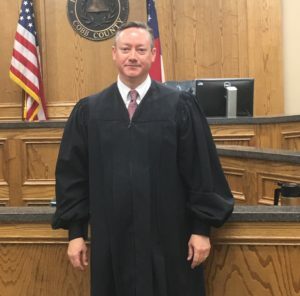 After many years of educating the community through seminars and answering questions of those that called or came to the office, Attorney John P. Farrell decided to take those answers and create a step-by-step guide to estate planning in Georgia. The end product was Estate Planning for the Modern Family: A Georgian’s Guide to Wills, Trusts, and Powers of Attorney. This book offers a step-by-step guide to protecting your estate for your loved ones, answers important estate planning questions for you and your family, and much more. 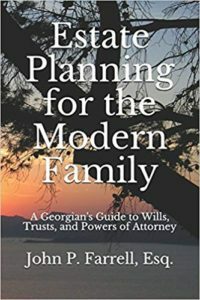 This book will help you learn what is involved with a Georgia Last Will and Testament, why a Power of Attorney is just as important as your Will, and how to plan with advanced estate planning techniques such as Trusts. If you live in Georgia, this book is a must read. Every month, we send a newsletter to over 1,000 subscribers who are interested in learning about important estate planning issues. (By the way, you can join these subscribers by clicking here and providing your name and email address). In each issue, you will find updates on changes in the law and articles about estate planning topics that come up at our office on a routine basis. Generally, as people come to the office and ask great estate planning questions, I will take the answers to those questions and put them on my blog. I will take a number of those blog posts, include them in the newsletter, and send it to the more than 1,000 subscribers. No matter where you are located in Georgia and Tennessee, we can help you with your estate planning needs. Although our main office is located in Marietta, Georgia, we travel all over the state in order to serve the needs of our clients. We can do this by providing unparalleled service and expertise that our clients cannot find anywhere else. Combine this with our easy-to-understand approach to estate planning, people come from all over for our services. It is our goal to make sure you have peace of mind when it comes to getting your affairs in order and how can you have that peace of mind if you don’t understand what your options are. We strive to be approachable and many people find comfort in knowing we want to make sure you are 100% pleased with the services you receive from our office. We take a lot of pride in these testimonials. We know that a satisfied client with tell others about the good job we do and those people will in turn become clients of ours. So, to us, providing excellent service and doing a tremendous job for our clients is of the greatest importance. YouTube videos – we provide educational videos on topics including Asset Protection Options for Georgia residents, Revocable Living Trusts, and Blended Family Estate Planning. You can access those videos by clicking here. Our Blog – One of the things we really enjoy is educating the public. To that end, we routinely update our blog on important topics like estate planning for military families, 7 movies with unbelievable scenes on estate planning, how to avoid common mistakes, and much, much more !! You can access our blog by clicking here. Legal Forms – there are a number of common legal forms used by Estate Planning Attorneys and you can access some of them by clicking here. There, you will find a Power of Attorney form, an Advance Directive for Health Care form, among others. Estate Planning doesn’t have to be complicated. But, it is important to get started. Above are 7 tips on deciding who to work with on your estate plan and we hope you’ll reach out to us if there is anything we can assist you with on your estate planning. Next Next post: Now licensed to practice law in Texas !